I like white water rafting. It's a lot like life. You are immediately dependent on a human-built contrivance (and on disciplined and effective cooperation with your fellow rafters). In the end, though, it is Nature that is carrying you along. White water is all "downhill," I guess you'd say. That's one way of looking at it. But it is really an impressive and exciting ride! 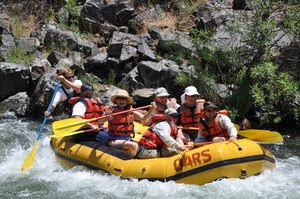 Click on the image if you'd like to help protect white water rafting on the Mokelumne River.